How Have the Pro Nikon DSLR Generations Fared? I’ve been analyzing a set of specific Nikon unit volume data that dates back to the original D1. As I do, I’ll be posting a few short articles on elements of what I find. Today, we’re going to deal with pro generation cameras: the single digit pro bodies. Remember, the D1 series consisted of three cameras: D1, D1h, D1x. The D2 series was four cameras: the D2h and D2x with s re-releases of both. The D3 series was again three cameras: D3, D3s, D3x. But the D4 series was only two cameras: D4 and D4s. 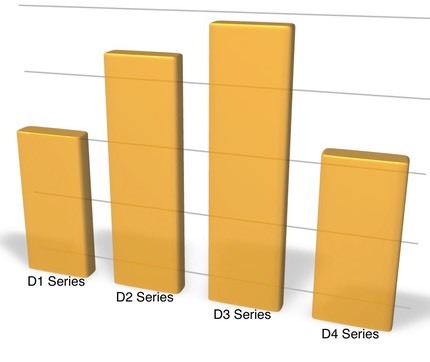 I suspect most of you think the D2 series did worse than the graph implies, while the D3 series should have done better. Thing is, at this level, we’re not talking about as many units as you might think: very low six figures is the best case, basically. The thing that strikes me is that the D4 generation happened after the peak of DSLR sales, and it shows. Coupled with one fewer model (no D4x), the D4 series numbers take us back to the levels at the beginning of the era. Personally, I still believe that Nikon made a mistake of not sticking the D800 sensor in the D4 body and selling a D4x. I’m pretty sure Nikon left money on the table with that decision, though they may have feared that everyone would just buy the cheaper D800. Personally, I’m not sure of that, at all. There’s a lot to be said for accessory (card and battery) and control standardization when you’re a pro rank shooter. Plus then there’s just that body that takes so much abuse compared to the smaller, even pro, ones. I think that all the post D3 issues (quake, flood, economy, DSLR peak) put Nikon a little too deeply into their conservative mode of operation. I’ll be curious to see how the D5 generation fares. We’re off to a good start with the apparent warm reception to the D5 announcement, which is generating more interest than the D4 announcement did, for sure. But has the market for pro cameras continued to collapse to the point where even a better product can’t overcome the volume decline? Difficult to say, but I’m rooting for Nikon. But please, a D5x, too!